If the bladder cannot be completely emptied, so-called residual urine remains. Since the rinsing of the bladder is impaired, germs can easily settle on the inner wall of the bladder and cause infections. This encourages as well the formation of urinary stones. If urinary retention remains untreated for a longer time, the infection may continue through the ureters into the kidneys. The result is chronic kidney damage, which can lead to kidney failure. Complete urinary retention is very painful and occurs when no more urine can be released and there is significant over-expansion of the bladder. Please contact your doctor immediately. The urinary bladder fulfils two important tasks. It stores the urine until it receives the command to empty. The bladder also drains the urine. 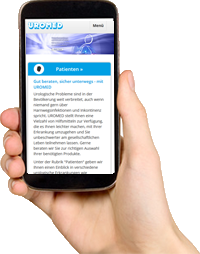 Disorders in bladder function can therefore be due to impaired storage function and impaired emptying capability. The urethra is enclosed by two circular muscles, the sphincters. The two sphincters and the bladder muscle work together to empty the bladder. The inner and outer sphincters open. Shortly after, the bladder muscle contracts. In a healthy urinary tract, this mechanism ensures that the bladder completely empties with little pressure and that no residual urine remains in the bladder. In addition to good interaction between the sphincter and bladder muscles, the nervous system must also be intact for the urinary tract to function properly. The nerve fibres and nerve impulses coordinate how the muscles interact. Other causes in men include for example prostate enlargements such as benign prostate hyperplasia (BPH) and prostate cancer. The growth of the prostate leads to a narrowing of the urethra. Passing of urine is therefore more difficult. The urine stream is attenuated and interrupted. In the advanced stage, residual urine forms. In women, a uterine prolapse can cause bladder complaints. The dropping of the uterus causes the urethra to be compressed. After initially increased urination, patients feel an urge to urinate again after only a short time. However, only small amounts of urine can be emptied. 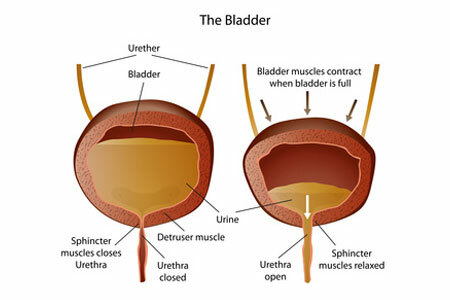 Residual urine remains in the bladder. A first indication that residual urine has accumulated in the bladder can be an ongoing bloating sensation of the bladder with constant urge to urinate. The amount of urine remaining in the bladder can be determined by catheterising the bladder or via a urography, which captures images of the bladder after it has been emptied (micturition). In adults, 100 ml of residual urine is considered to be an abnormal level; in children, a residual urine level in excess of 10 per cent of bladder capacity is considered to be abnormal. Transurethral catheterisation of the bladder after emptying (micturition) is an invasive method to determine the residual urine. Regular catheterisation can reduce the risk of infection quickly and reliably. Moreover, the bladder can contract again. A chronic thickening of the bladder wall due to over-expansion is avoided. 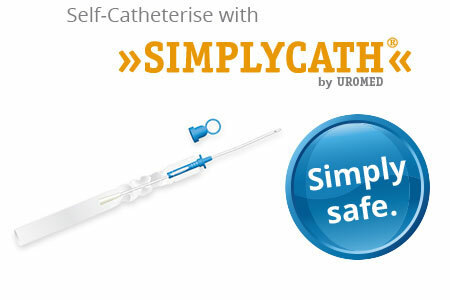 The »SIMPLYCATH®« disposable catheter, which minimises the risk of infection with a guide tip, is easy to handle and quick for patients to learn. »SIMPLYCATH®« brings back a good dose of normalcy into life and permanently supports bladder and kidney health.